I find this book quite unique and a gem amongst photography books. Initially I was a little doubtful as the title promises a lot. Many books promise so much but fail to deliver. That’s not the case with “Take your Photography to the Next Level”. Mr Barr should take a bow and I think every photographer should read if not a copy of this book. The trend it seems with photography books is one of repetition. You see the same material and advice trotted out time after time. Few authors it appears try to approach the subject in a fresh way. I suspect a lot of this re-writing of material has a lot to do with the book publishers. Whatever the root cause, it’s nice to see a book that ploughs its own furrow. From the photographer’s perspective, this is an excellent book by George Barr. How many books actually describe how to work a scene in order to get the best from it? Can you name many books provide a fresh perspective on taking great photography? How many books challenge you to grow as a photographer and improve your skills? Although I like to think that my book “The Photographers Coach” also does these things. Something else that this book does is to consider subject matter and composition. But, it doesn’t do this in the dry theoretical way as many books do. Instead it illustrates what works and what doesn’t in an engaging and practical way. The book has plenty of great images that are inspirational as well as having a unique style. In case you didn’t know, George Barr is an excellent photographer but not a professional. 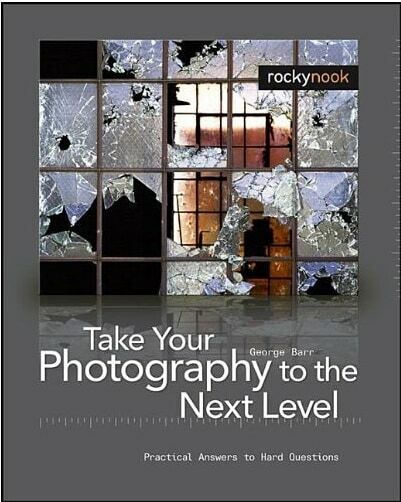 I recommend this as an early buy for anyone getting into photography as well as for more experienced photographers. In fact, better buy two copies in case one copy wears out as you continue to refer to it for years to come. You can find more recommendation for great photography books on the Books Review page . If you have a personal favourite photography book that I haven't reviewed, why not send me the details. I’ll consider it for future reviews.